Our Protective Design and Security practice helps architects, owners, developers and public agencies achieve security objectives while upholding each projectâ&#x20AC;&#x2122;s aesthetic, functional and budgetary goals. A recognized leader in security services, we collaborate with clients and project teams to develop physical, electronic and operational security solutions for facilities of every type, use and size. E-mail us if you would like to collaborate or learn more about our services. We would love to stop by your office and learn about your project aspirations and requirements. We help reduce the risk associated with active-shooter scenarios. 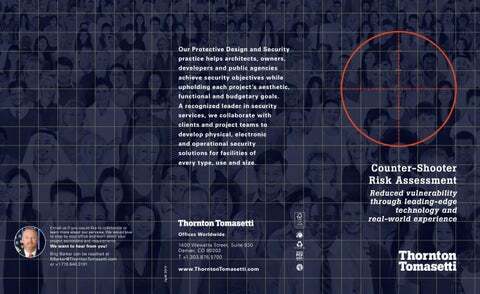 As concealed- and mass-shooter threats continue to escalate, Thornton Tomasetti has developed a detailed assessment tool to better prepare facilities for potential incidents. Our team performs an on-site assessment to evaluate facilities from a medium-to-longrange shooter’s perspective. We look for vulnerabilities – in weapons infiltration, shooting platforms (internal and external), ingress and egress options, and overwatch access from nearby high-rises. Our experts also identify the best locations for law-enforcement reaction forces and provide recommendations on effective emergency response. Here’s how. Our Protective Design & Security practice conducts counter-shooter risk assessments (CSRAs) for stadiums, hospitality infrastructure and entertainment venues of all types and sizes. Each CSRA entails a two-day site visit during which we evaluate vulnerabilities from potential external points of attack (POAs). These may include high-rises, hotels, apartment buildings, freeways, abandoned buildings or parking garages. We employ cutting-edge software tools to supplement the on-site assessment and overall analysis, providing clients with detailed images, along with estimates of a facility’s risk exposure from each potential POA location. We evaluate your venue from the shooter’s perspective. Our security team is made up of former professional snipers with backgrounds in law enforcement and the military, who conduct a thorough assessment of your facility, both internally and externally, evaluating vulnerabilities according to eight crucial risk factors. We compile the results of our evaluation into a comprehensive report, which includes a threat analysis, identification of the top 10 external POAs, extensive line-of-sight imagery from POA locations, photographs and recommended approaches to mitigating vulnerabilities. Finally, we provide a professional briefing summarizing the CSRA findings. 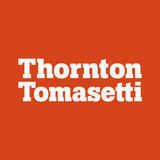 Additional Offering: Full-facility threat, vulnerability & risk assessments (TVRAs). We conduct comprehensive TVRAs for venues, identifying vulnerabilities and offering mitigation options for clients. Our experts – in counterterrorism, cybersecurity, crime prevention through environmental design, and electronic, operational and physical security – provide clients with information that enables proactive protection of personnel, critical assets and infrastructure. We customize our process to provide clients with options that dovetail with existing corporate culture and meet budgetary requirements.